This famous surname is regarded as being of "Crusader" origins, and found in every European country. That is to say it is a name associated with the Christian Faith, and one whose popularity followed the twelve Crusades by the knights of St John, under the command of various European kings in particular Richard, Coeur de Lyon, of England, to free the Holy Land from the Muslim. All the Crusades were unusuccessful, but it was not for want of gallantry, on either side. Returning knights, as a reminder of their efforts, gave their children names associated with the Bible. One of the most popular was Thomas. This was an Aramaic byname meaning "twin", and borne by one of Christ's disciples. Prior to the Crusades the name Thomas was found only as a priest name, but thereafter became one of the most popular male personal names, generating a wide variety of surnames. The patronymic forms from diminutives, such as Thomson (the Scottish form) and Thompson, found mainly in England and Northern Ireland, appear firstly in the 14th Century, the first recording being from Scotland. The intrusive "p" of the English and Irish forms was for easier pronunciation, and the wild fable about "p" meaning prisoner, is total rubbish. If "p" did imply prisoner, every name would have one! One of the earliest recordings is that of John Thompson in the charters of the Abbey of Whitby, Yorkshire, in 1349, whilst amongst the early church recordings is the marriage of David Thompson and Mary Clarke on May 29th 1664 at St. Giles Cripplegate, in the city of London. 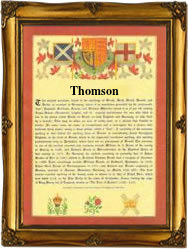 The first recorded spelling of the family name in any spelling is believed to be that of John Thomson, which was dated 1318, in the Annals of Scotland. This was during the reign of King Robert 1st of Scotland, known as "The Bruce", 1306 - 1329. Throughout the centuries, surnames in every country have continued to "develop", often leading to astonishing variants of the original spelling.